The holidays are among us, which means the New Year is quickly approaching. With the New Year come plenty of new years resolutions. I know plenty of you will be focusing on health goals such as losing weight, improving fitness, or finally running that 5K etc. However, I want to encourage you to also focus on one main factor of overall health that most overlook: injury prevention. Most of us, including athletes of all levels of experience, come out of the gates strong, sometimes a little reckless, and end up battling injuries all year. It’s a never ending battle unless we learn to take a step back and incorporate strength training exercises designed to strengthen main muscles groups for specific sports. This exercise is great for single leg strength and balance. Strengthens quads, hamstrings, and gluts. Not only is strengthening these muscles groups essential to injury prevention, but improving balance can be the difference between a twisted ankle and a healthy ankle. “At the end of the day, basketball is played on one foot. Whether it be shuffling or jumping off one foot. Therefore, it’s better to practice on one,” explains Chris. teaches deceleration. 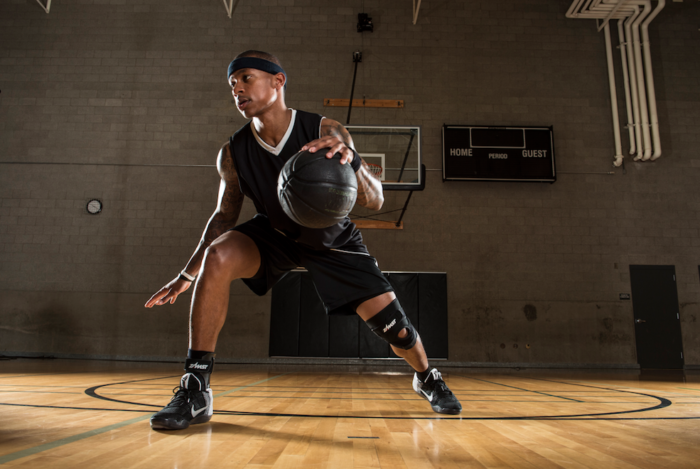 In basketball, we hear a lot about ankle sprains due to landing incorrectly after jumping. Surprisingly, knee injuries are equally as common. This exercise allows us to work on shock absorption, thus reducing the risk of a knee injury, especially ACL tears. Not all basketball related injuries take place in the lower extremities. Dribbling, blocking, and of course taking shots at the hoop all use major muscle and skeletal groups of the upper body. The goal of this specific exercise is to strengthen posterior shoulder stabilizers. This aids in defending and preventing shoulder injuries. Keep your eye on the prize of overall health and fitness this upcoming New Year, but don’t overlook strength training. You can only achieve your fitness goals if you are free of injuries.